"Lord Jesus, Chief Shepherd of the Flock, we pray that in the great love and mercy of Your Sacred Heart You attend to all the needs of Your priest-shepherds throughout the world. We ask that You draw back to Your Heart all those priests who have seriously strayed from Your path, that You rekindle the desire for holiness in the hearts of those priests who have become lukewarm, and that You continue to give Your fervent priests the desire for the highest holiness. United with Your Heart and Mary’s Heart, we ask that You take this petition to Your heavenly Father in the unity of the Holy Spirit. Amen." 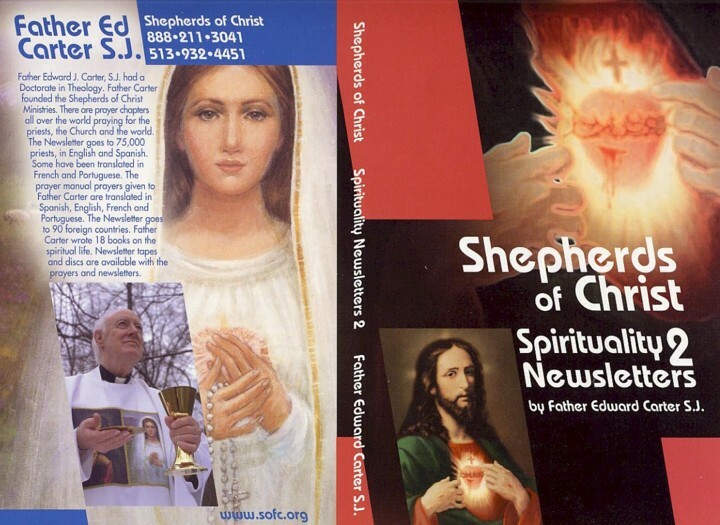 "Father, we ask Your special blessings upon the priestly newsletter, Shepherds of Christ. We ask that You open the priest-readers to the graces You wish to give them through this chosen instrument of Your Son. We also ask that You provide for the financial needs of the newsletter and the Shepherds of Christ Associates. We make our prayer through Jesus, in the Holy Spirit, with Mary at our side. Amen." For all members of the LMNP 2019, and for the spread of this movement to the world. PRIMARY MINISTRY - CIRCULATING PRIESTLY NEWSLETTERS TO PRIESTS ALL OVER THE WORLD IN ENGLISH AND SPANISH to promote priestly holiness. PRAYER CHAPTERS praying for the priests and the renewal of the Church and the world. School Rosary Program and Junior Shepherds of Christ Ministry. Special retreats and adoration before the Blessed Sacrament. Apostles of the Eucharistic Heart of Jesus. Promoting the rosary to all, rosary meditations. Prison Ministry to promote prayer and spiritual renewal. Audio/Video Departments (priestly newsletters on tape). Prayer books, newsletters, newsletter books, and other spiritual aids. WE WANT TO BE INTERCESSORS PROMOTING UNITY IN PRAYER WITH ALL PEOPLE OF THE WORLD, PRAYING FOR THE PRIESTS, THE CHURCH, AND THE WORLD. We have described above the primary ministry of the Movement, the spirituality newsletter for priests, Shepherds of Christ. The 2nd most important ministry is the prayer chapters, whose members pray for the needs of priests and for the needs of all others also. Other ministries include promoting the act of consecration to the Hearts of Jesus and Mary as widely as possible. Promoting this act of consecration permeates all of our ministries. We also promote the praying of the rosary, and we have a special program regarding the rosary and the act of consecration for school children. We have programs for prisons and nursing homes to encourage the residents to pray for priests, the Church, and the world. We also publish various books, cassette tapes, and other materials to help in the ongoing work of spiritual renewal. Consecration to the Hearts of Jesus and Mary—until a sufficient number of people make and live the consecration, we will not have peace in the world. Observing the First Saturday Devotion. Making reparation to the Hearts of Jesus and Mary. In helping to bring the Fatima message to completion, the Shepherds of Christ Movement is helping to bring about the Reign of the Sacred Heart and the triumph of the Immaculate Heart. This is a great privilege and a great responsibility! We ask for your prayers and help in other ways also. May God bless you abundantly! There are seven levels of commitment in the Shepherds of Christ Movement. There are Associates who gather and pray at least once monthly as a group and also help with donations to support the Shepherds of Christ priestly newsletter. They can be tremendously involved. They give as they feel they are able. Apostles are members who have restricted their apostolic activity to the Shepherds of Christ. They literally act as a body of lay people who have given their lives in their present living situation to do all that they can to bring about the Reign of the Sacred Heart and the triumph of Mary's Immaculate Heart. Prayer Apostles are often shut-ins, some are able to go to church and pray. They spend much of their lives praying for the Movement. Handmaids of the Good Shepherd are young and older women who have given their lives in community primarily to pray for the Shepherds of Christ Movement and intentions and to be special spouses of Jesus. Some have more duties than others. All have the primary duty of prayer and the desire to be a special spouse of our Lord. One of the functions of the handmaids is the involvement in praying for and helping to circulate the priestly newsletter. The handmaids are not members of a religious order. Servants of the Good Shepherd are men who live in community with a lifestyle and purpose similar to that of the handmaids. The servants are not members of a religious order. We wish to form a special congregation of priests who will realize their great oneness with Christ. They will be consecrated deeply to the Hearts of Jesus and Mary and support the Shepherds of Christ Movement as holy priests. Whatever one's level of commitment in the Shepherds of Christ Movement, all share in promoting the overall goal of the Movement. This goal is to help in the spiritual renewal of the Church and the world. All varied ministries of the Movement are directed toward this purpose. The spirituality which the Shepherds of Christ Movement presents to its members and to those outside the Movement through its various ministries is very basic. This spirituality is explicitly Trinitarian and Christocentric. Our spirituality helps others, especially priests, to develop a very deep union with Jesus, this Jesus Who leads us to the Father in the Holy Spirit with Mary at our side. Our spirituality is deeply Eucharistic. We stress very much participation in the Mass and prayer before the Blessed Sacrament. We also emphasize the extremely important role of prayer in the spiritual life. Devotion to the Hearts of Jesus and Mary, especially consecration to Their Hearts, is also a most important and central element. We are very much interested in helping to bring the Fatima message to completion, a message which has consecration to the Hearts of Jesus and Mary at its very core. Father Edward J. Carter, S.J. Father Edward Carter, S.J. was a native of Cincinnati, Ohio. A graduate of St. Xavier High School and Xavier University, both in Cincinnati, he was ordained a priest in 1962 and received his doctorate in theology from Catholic University of America four years later. He was a professor of theology at Xavier University in Cincinnati for over 30 years. He has authored 17 books in the area of Catholic spirituality. His two latest books are the priestly newsletter books, which include the newsletters from almost six years. He is devoted to the Sacred Heart of Jesus, and the Immaculate Heart of Mary. PLEASE HELP US THROUGH YOUR PRAYERS UNITED TO OURS. PRIESTS PRAYING WITH US WILL INCREASE THE PRAYER POWER; THEY ARE ANOINTED BY CHRIST AS HOLY PRIESTS. PEOPLE ALL OVER THE WORLD offering up their lives in the Morning Offering for the priests, the Church, the world, and for the work of the Shepherds of Christ will help so much. LITTLE PRAYER BOOKS OF SHORT PRAYERS CALLED THE SHEPHERDS OF CHRIST PRAYER MANUAL ARE AVAILABLE. Praying these short prayers together with us as a body united to the Holy Sacrifice of the Mass being celebrated around the world can help great grace be released on the souls of the earth. Today’s Gospel in its story certainly points ahead to Jesus in His Passion and death. And as we read passages such as this during the Lenten season, we are reminded once again that the Church in her Liturgy of the Word gives us an opportunity to undergo a purification, an ever deepening cleansing of ourselves so that we may be a more fit instrument for receiving the great graces which are to be given to us at the time of the Resurrection memorial on Easter. And so all in all, Lent is a time of purification to prepare us for ever-greater gifts of the Lord. It’s a time of self-discipline, a time to renew our efforts to be self-disciplined in the service of the Lord. Self-discipline is an aspect of purification. And I suggest that one of the most difficult acts of self-discipline in the spiritual journey is to concentrate on the present moment. We have a very strong tendency to disregard the importance of the present moment by focusing in a wrong way on the past or in a wrong way on the future. There are proper occasions for thinking of the past and the future. For example, we have to learn from the past and we have to prepare for the future, but our great emphasis has to be upon the present. There is a Latin axiom which says, age quod agis, age quod agis, which means: do what you are doing, concentrate on the present. And of course we are familiar with that term in the history of spirituality: the sacrament of the present moment. And so the discipline of Lent certainly encourages us to include in a deeper self-discipline a greater determination to get as much as we can out of the present moment. People with a terminal illness have an opportunity as they prepare for death for increased prayer, contrition, love of God. However, some are taken very, very quickly. But for those who have the opportunity of knowing with some certainty the time of their death, I’m sure as they look back on their lives, they are saddened by the many times they did not use time and opportunities for the service of the Lord properly, and are overjoyed at those times in which they did use the present opportunity properly. A great means we have of living in the present properly is a greater focus upon our Lord. For if I have that awareness of the fact I am united with Jesus here and now, why should I be concerned so much about the future or the past? Yes, a great help in living in the present and deriving all the good we can from it for ourselves and others is an ever greater focus upon Jesus, because the more I focus upon Jesus and the more I live with Him in the present moment, the more I am satisfied with the present moment. And so let us in our Lenten activity resolve to grow in that self-discipline - which is very difficult at times - to really live in the presence with the fullness of our being as much as is possible, with the help of God’s grace. Now is the day of salvation. Now is the day of salvation. There is but one true Church of Christ. Yet this one Church has three different states of existence. There is the pilgrim Church, the Church of this world, composed of members who have received the grace of Christ and strive for its development. They have not yet obtained the goal of their efforts, as have the members of the heavenly Church, who enjoy God in eternal happiness. The Church suffering is an intermediate state of existence necessary for those who had not achieved the required purification as members of the pilgrim Church. Although there are these three phases of the Church’s existence, there is a profound union existing between all the members. All these members possess the same basic life of grace in Christ, and this common life establishes the most intimate bonds of love. In our preceding chapter, we discussed the pilgrim Church. Let us now consider the Church suffering and the heavenly Church. The members of the Church suffering are those who have departed from this life in an incomplete state of Christian development. Their development is incomplete in the sense that grace has not fully taken possession of them, and, as a result, they are yet closed in upon themselves to a greater or lesser degree. They as yet cannot open themselves out in complete love to the Triune God in the beatific vision. They must undergo a further purification, a purification which could have been achieved upon earth with merit. Now the purification must be achieved with no merit attached. The pain of this purification is mixed with the certain expectation of achieving the vision of God. We can hasten the advent of this vision for this people by the offering of prayers and other good works. Scripture itself refers to our action on behalf of those in purgatory in Chapter 12 of the Second Book of Maccabees beginning with verse 38. The members of the heavenly Church are those in whom the life of grace has taken full possession and has reached its completion in the life of glory. Faith now is unnecessary, as the light of glory gives the human intellect a new strength and capacity for seeing God face-to-face. While the Christian was a wayfarer, he received the imprint of the indwelling Trinity as he shared in God’s own life. Now in heaven that grace-life and possession of God reaches its completion—the absolute completion is not achieved, however, until the resurrection of the body. The divine persons give Themselves to the beatified in a profound union far surpassing that of the indwelling of the Trinity experienced here below. This life of heaven is still the Christ-life, for just as we possess a share in Trinitarian life here below as mediated by Christ, and exercise this grace-life as structured by Him, so also in heaven is the mediation of Christ present. In the words of Rahner, "One always sees the Father through Jesus. Just as immediately as this, for the directness of the vision of God is not a denial of the mediatorship of Christ as man. "14 And not only does the humanity of Christ unite the blessed to God, but also, in some way, to the whole of creation. This is merely a completion of what is begun here below, namely, the union with Christ in His humanity establishing the Christian in a special relationship with God, with other men, and with the whole of creation. We have a glimpse, therefore, of the fullness of life which members of the heavenly Church possess. The members of the heavenly Church can help us in living our life of grace until we too share its fullness with them. Their power of intercession on our behalf is but another ramification of the communal aspect of Christianity. We are meant to help others grow in Christ. We, in turn, are intended by God to receive aid from others—yes, from members of the heavenly Church, as well as from those with whom we dwell here below. ...In reference to Christianity, God himself is the ultimate mystery. Radically, God is completely other and transcendent, hidden from man in his inner life, unless he chooses to reveal himself. Let us briefly look at this inner life of God. At the destined moment in human history, God's self-expression, the Word, immersed himself into man's world. God's inner self-expression now had also become God's outer self-expression. Consequently, the mystery of God becomes the mystery of Christ. In Christ, God tells us about himself, about his inner life, about his plan of creation and redemption. He tells us how Father, Son, and Holy Spirit desire to dwell within us in the most intimate fashion, how they wish to share with us their own life through grace. All this he has accomplished and does accomplish through Christ. St. Paul tells us: "I became a minister of this Church through the commission God gave me to preach among you his word in its fullness, that mystery hidden from ages and generations past but now revealed to his holy ones. God has willed to make known to them the glory beyond price which this mystery brings to the Gentiles—the mystery of Christ in you, your hope of glory. This is the Christ we proclaim while we admonish all men and teach them in the full measure of wisdom, hoping to make every man complete in Christ" (Col 1:25-28). The place Jesus took me was into the deepest recesses of His Heart. I was enveloped in His burning love. It was a red room with heat and an intense glow. I was swept away in this embrace, and I only existed in Him. The power of the Almighty God enveloped me, and I only existed in Him. There was no fear, for I was existent in this Almighty Being. My heart was wrapped in the eternal embrace of this Supreme Being. The security, the power I know was His deep presence in which I existed. I knew the room was red and warm. I knew His immenseness, but I felt my own completeness in Him. I did not feel little, as a speck, but elevated and empowered for I existed then in Him in a most special way. I was overtaken by the love of God. The fire of the Holy Spirit filled me. I was absorbed by the love of the Father, and I existed IN Him and in the deepest recesses of the Heart of Jesus. Our heaven on earth is these inner chambers of His magnificent Heart - the Heart of the Almighty God, with all the power, with omnipotence, with the fire of the love of God. He took me to the deepest chamber of this fiery Heart, and in that moment, I touched eternity, for I knew what it was to be enveloped in the deep furnace of His love. I now want to exist in this chamber of His Heart, swept away in His burning love, absorbed in my every cell with His love. We do not understand the fire of His love. We do not understand what it is to be absorbed by love itself. He took me to the inner, deepest chamber of His Heart, and I felt the heat and knew the presence of love itself, and there was no fear, only a feeling of completeness, omnipotence, all-embracing, penetrating love - a power indescribable in words, a saturation of my being in the presence of God, and I was as I was created to be - living in Him! This is how I will forever live my life, saturated with His divine life and love deep within this inner chamber of His burning Heart, living in Him as He possesses my being, and I operate with His power in me. Little creatures though we are, we are His, His power, His life, flowing through us. In Him, we are as the Father intended: one in Him, each one of us, dwelling in this fiery furnace of His love. With our fears quieted and our hearts empowered by His life, we live forever in Him - in the Heart of Jesus. Let no man separate what God has joined together. I am wed in the deepest love with my beloved Spouse, wed to the Heart of Jesus. As I am, I am one in Him. I live and I breathe in Him. He, Who is love, He Who is our all, He Who is mighty and without limits, He Who is, He Who is God and as I live, He lives in me in this world. I am wed to Him, and I shall not fear for He is God - one, complete, loving, God. Heart of Jesus, I place my trust in Thee. As I live, I live in Your most adorable Heart, the furnace of God's love!